Voice menus allow you to route a call efficiently by the use of key presses. The caller will hear a voice prompt providing them with options, for example to press one for support or two for sales. They will then be transferred to the desired destination automatically. To get started, select Voice Menus from the top menu of your control panel. Use the Create Voice Menu box to setup your new voice menu.Select an unused internal number, enter a name for the voice menu and an email address. Click Create to finish creating the group. Customising the group is a simple process. Before you start, you will probably want to record some voice prompts to use to guide the caller, you can do this in the Voice Prompts area of your control panel (this article provides more help with creating voice prompts). To add key press options to the menu, use the Actions section. Select the digit you wish to customise using the Digit dropdown box, and then the destination that that key press would lead to in the next drop down box. 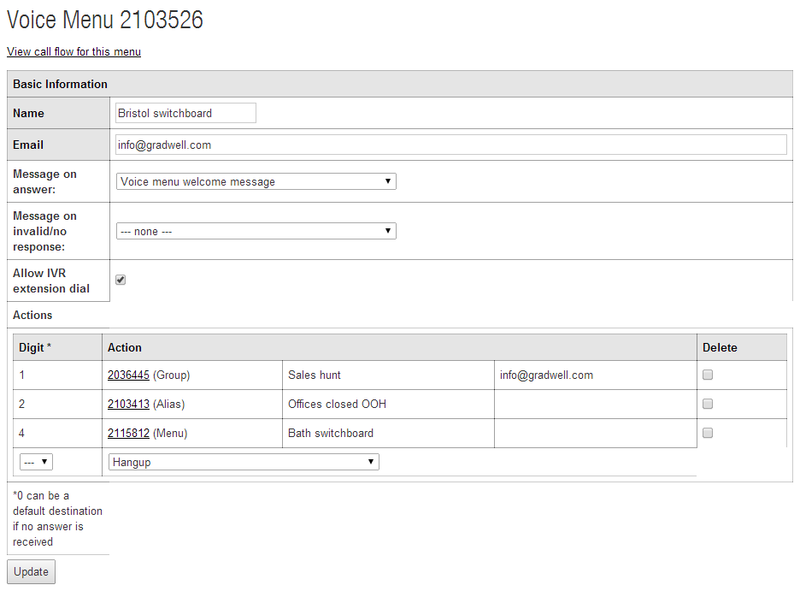 This can be an individual extension, an alias, a hunt group, a queue, a conference room or even another voice menu. You can also give the caller the option to hangup. Click Update when you have added the options you require.